A couple of days ago I saw this picture and fell in love. At first I thought they were rolls, but I later figured out that they were cookies with a lemon filling. Sadly, I have yet to find a recipe. But I do think it would be fun to use this as a model for some bunny rolls. Although, they really are almost too cute to eat. But if you are in the market for some cute bunny rolls, here are a couple that I have found. 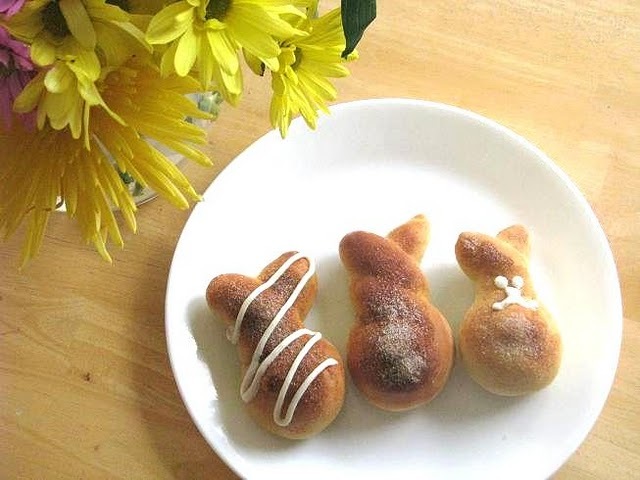 Taste of Home has a recipe for these Easter Bunny dinner rolls, although I am sure the bunny making method would work with your favorite roll recipe as well. Gluesticks has a recipe for cinnamon bunny rolls. 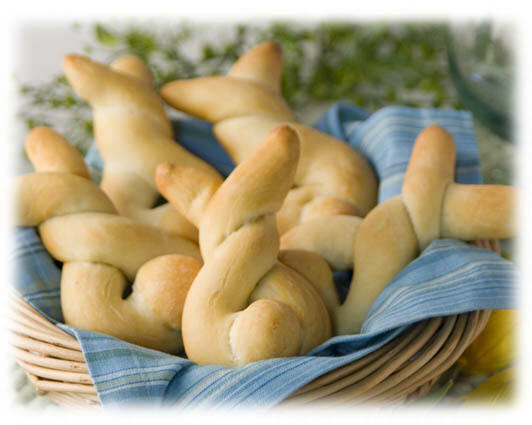 I think this is the bunny we will try to make, but just in dinner roll form. Something like these bunny buns (which is exactly what I will be calling them at Easter dinner because it will make my 3-year-old giggle) from Rhodes. What bunny buns will you be serving at your house? Oh gosh these are all ADORABLE! I love them all, they are so darn cute! What creativity! Thanks for sharing! Those are so cute!! What a fun addition to Easter dinner! omg, these are all so freaking cute!!! I love these! Can't wait to make them. Thanks so much! These bunny rolls are so cute, thanks for compiling the links! I am featuring your post tomorrow on my blog, thanks! Oh my, how cute is THAT!!!! I don't have the time to make bread from scratch, but these would be super easy to make with crescent roll dough. Just roll each piece into a long thin tube and twist them up! This is what I found out about them. It's a Japanese product; it's limited during the moon festival time." So it looks like no recipe to get. Those bunny breadsticks are going to be served in this house. I love this, thank you! I too pinned the bunny pic, and was disappointed there were no directions. Your research and ideas are very much appreciated. Btw, I came across your blog googling "bunny rolls"... now to check out your blog! Had an idea for the bunny rolls...if you took those freezer rolls that are in a ball shape, let them thaw, then took a pair of scissors and snipped the ears so they were standing out from the roll a bit. Then, you could take an edible marker and put the eyes on after they baked! 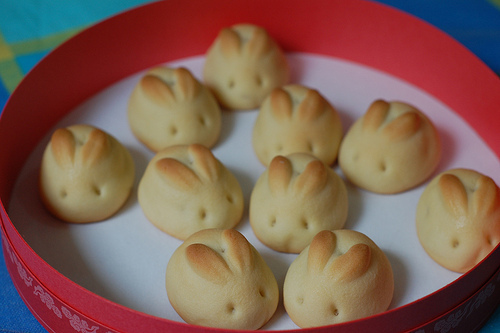 First pic of adorable bunny cookies, am hoping this would work with rolls, too. 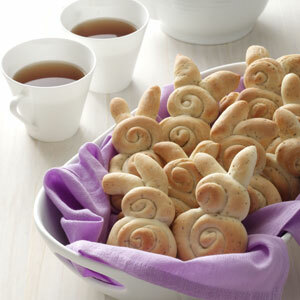 I have a tutorial for bunny rolls on my blog that look very similar to the picture at the top of your post. They're easy to make and so cute! The recipe I have for these cookies actually uses yeast, so it's not a sugar cookie at all. More like a blintz. You might use currants for eyes. I found a recipe on the lemon bunny cookies through a bunch of research on the internet. Take a look, let me know if you try these I would love a picture.